Add ingredients for simple syrup to a small saucepan. Bring to a simmer and stir until sugar is completely dissolved. Allow syrup to cool. Stir syrup into ros wine. Add 1 tbsp at a time until it reaches your desired sweetness. How much you will need will also vary on the wine you use as some are sweeter than others. 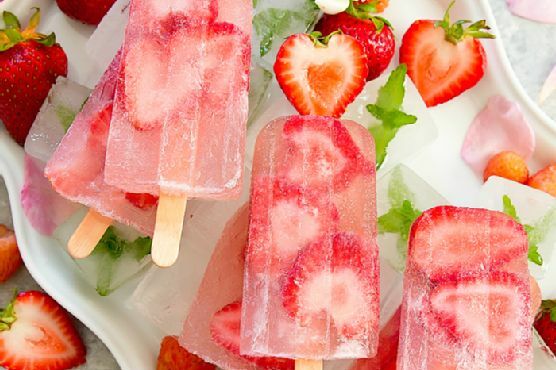 Add about 3 slices of strawberries to each popsicle mold. Then fill with ros wine.My popsicle molds hold 3 oz of liquid, and after the strawberry slices, I added 2 oz of wine to each mold. Place in popsicle sticks. If the sticks float, you can put mini clips on them to hold them down in place. Freeze ice pops overnight. Remove according to manufacturer's instructions. For the ones I use, it requires you to run the molds under warm water for a couple of seconds. Even though these ice pops will start to loosen after a few minutes at room temperature, I still find it's best to unmold them after running under warm water, otherwise ifI just remove them after letting them defrost at room temperature, they usually will break as I try to remove them.